1CRM Mobile is a free download for Android devices in the Google Play Store. Works with all 1CRM subscriptions running 1CRM 8.5.2 and above. What Is 1CRM Mobile for Android? 1CRM Mobile features optimized mobile access to your complete 1CRM system – every module as well as admin capability. Now you can easily track opportunities, take notes, connect with clients, create tasks, and manage your projects and service cases from anywhere. Create quotes or invoices on the spot and email them as PDFs to clients instantly. All changes are instantly visible in the main 1CRM system – providing your colleagues with access to your real-time information. From group calendaring, through normal sales workflow tasks, to creating and sending Quotes/Invoices/Service Work Orders on the fly from your phone – its all there! Remote or traveling team members can access up-to-the-minute lead, contact and account details, notes, scheduled calls and meetings, and sales opportunities. You choose if clicking on a phone number in 1CRM dials using your mobile phone, or Skype or RingCentral apps instead. Click on an email address to communicate using either 1CRM’s built-in email or your phone’s email client. All user sessions are fully SSL encrypted using a standard certificate. Adjust role permissions to manage data access & capabilities for users and teams. Asynchronous resource loading techniques deliver super-fast performance. 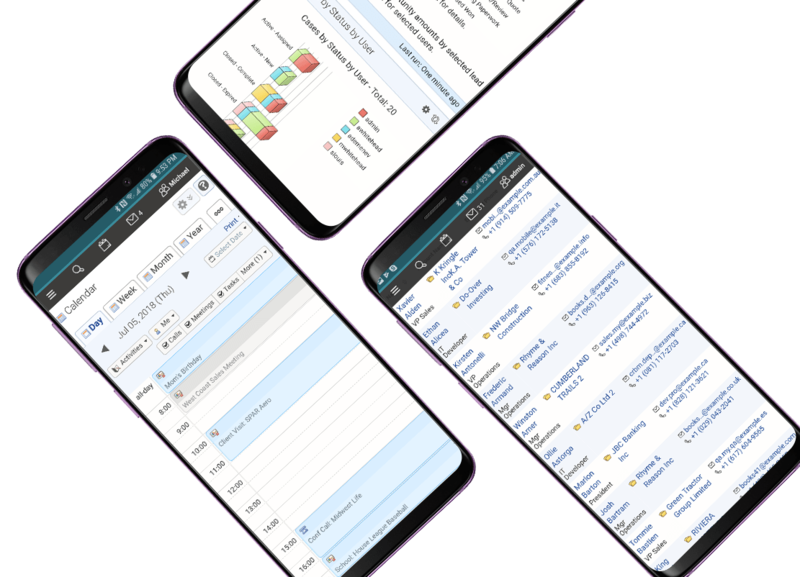 View and update projects and their tasks, and share data instantly with colleagues in the web app doing Gantt chart planning and real-time budget tracking. 1CRM reminders are integrated to the Android Notifications ecosystem – receive your CRM reminders as native Android notifications! From group calendaring, through normal sales workflow tasks, to creating and sending Quotes/Invoices/Service Work Orders on the fly from your phone – it’s all there! Download the latest version of 1CRM Mobile from the Google Play Store. Share with Colleagues & Have Fun! Explore the 1CRM Mobile app and all its functionality. Access your essential business data quickly and easily from your iPhone! Learn all about the 1CRM Android App by watching a video!